Fancy getting involved? From magic Lantern film nights, sewing workshops, fetes, festivals, cycles or putting on your own event there are plenty of ways to help and have fun! Please get in touch if you’d like to know more than we have provided below and we’ll get straight back to you…. Spring is here and to celebrate our friends at Magic Lantern Film Club will screen the seminal film Urban Roots and invite attendees to plant some Magic Seeds as part of Bristol Green Week 2013 on Wednesday 19th of June. The location will be kept secret until the night and 7pm meeting point will be announced nearer the time. 100% of the money raised from the Magic Lantern will be to us for our work with orphaned children in Uganda. There are 50 places at the screening and we hope you will honour us with your presence…reserve your places now! We’re having a pub quiz this Thursday in Bristol for Awamu! Organised by the fabulous Kerry Bradshaw and Lorraine Hudson. ALL Welcome but there are only 11 tickets left so reserve a space for you and your team now! Top Prizes = massive bottle of whisky, awamu african print cushions (x2) and massive box of chocolates! All donations on the night to Awamu! Fancy organising your own event for Awamu? its a great way for getting colleagues and friends together and we can help with the format and promoting contact us if you fancy putting one on..
Our new crafting workshops have been inspired by the colourful bird life of Uganda! You don’t need any previous experience or sewing skills, you follow simple patterns and we’ll talk you through it! All materials are included in the £10 fee and all the profit from the afternoon will go to awamu to give orphaned and vulnerable children in the slums of Kampala a special treat this Christmas. Reserve your places now on the facebook event page (links above) as spaces are limited. If you have any questions don’t hesitate to get in touch. We really hope you can make it. Children from 8 upwards are welcome with parents too! 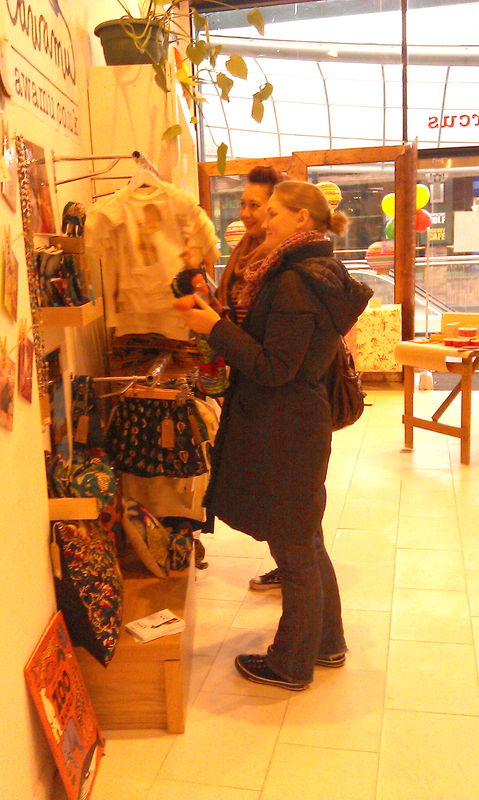 Last Friday we opened the doors to Secret circus pop-up shop in Bristol’s Cabot Circus. We’re really proud and honoured to be invited be a feature in the shop by Kerry and Michelle (the brains behind this awesome pop-up). 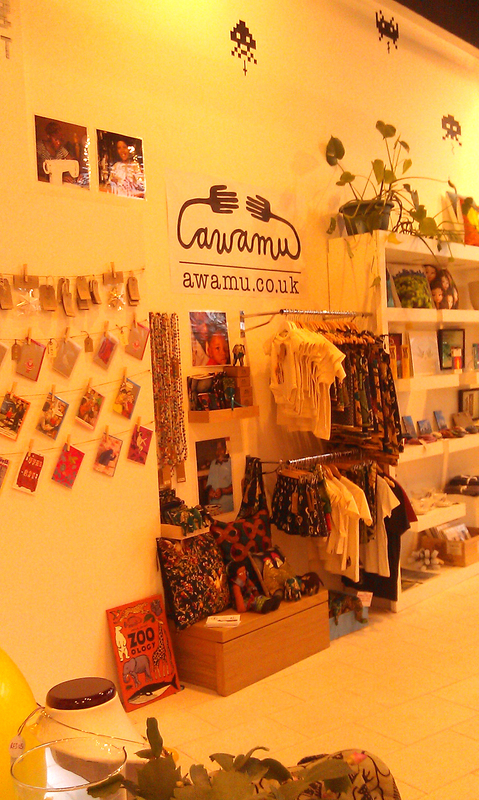 Secret Circus is an independent shop & event space featuring awamu goods along side local artist’s & makers – it’s full to the brim with beautiful gifts, clothes, prints, cards, vintage goodies and there are a host crafting , films nights, retro gaming events planned in the run up to Christmas. We’ll be hosting a sewing event in the shop on the 9th of December inspired by the bird life of Uganda! 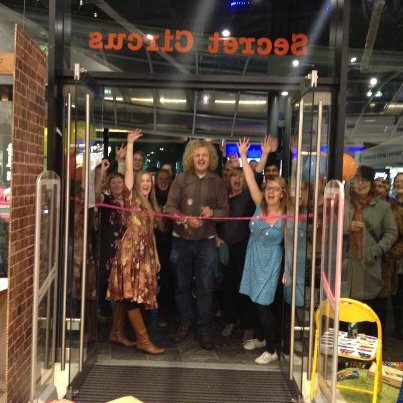 Cutting the ribbon with Bristol legend ‘Big Jeff’..
Is it too early to talk about Christmas shopping? We were very honoured to be invited to be part of the We Make London area at Old Spitalfields market this Saturday the 10th of November. There will be a mixture of stalls ladened with festive goodies and showcasing the talent and creativity designers and makers – you’ll be able pick up plenty of unique and stylish gifts…..and of course sample the foodie delights that Spitalfields is famous for. Old Spitalfields Market is one of London’s finest Victorian market halls. Set in an historic location in the heart of the City and one of the crown jewels of East London. Well, not in years – you measure cinemas clubs by screenings of course. The wonderful Kerry and Joey at Magic Lantern Film Club would love you to join them on this momentous occasion on the ‘sprightly’ dark evening of Friday the 2nd of November. To celebrate their milestone every ticket holder to this event will get vouchers for this special secret squirrel venue. Please note this film is a bit scary and an 18 but no need to fear, you will always be safe with the Magic Lantern crew. As ever the meeting point for this Magic Lantern Film Club event will be announced nearer the time. Not only will you get a fabulous evening of entertainment but 100% of the money raised from the Magic Lantern will come to the amazing awamu to help orphaned children in we work with in Kampala. So far Magic Lantern events have raised £3675 – thats just short of enough to support 4 children through 7 years of primary education – AMAZING! It’s going to be a special one. 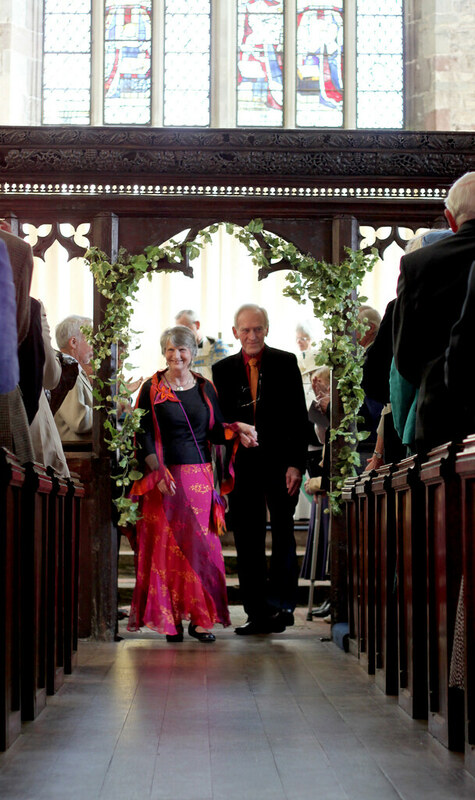 Congratulations to Annie and hugh who were married on the 6th of October 2012. A massive thank you for choosing donations to awamu as a alternative to wedding gifts and to all their friends who were so very generous.